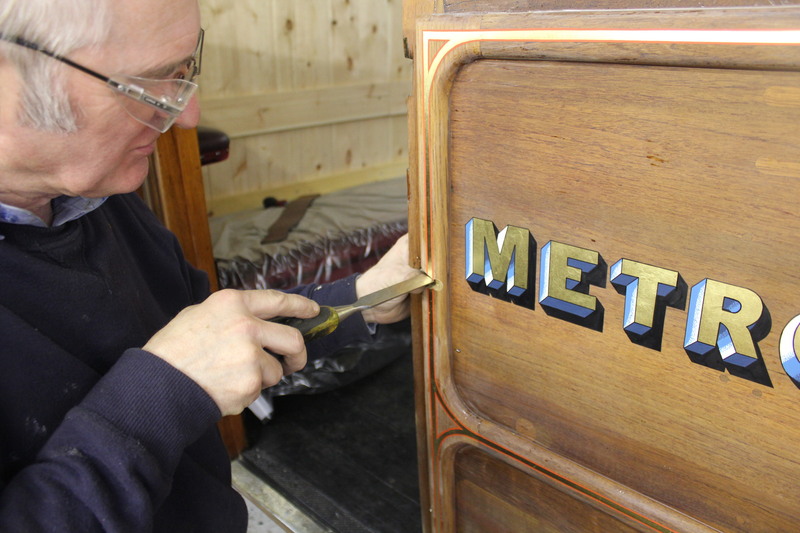 Excellent progress has been made on the carriage restoration over the summer months. As with most projects of this type there is huge pressure between planned cost, available time and the resulting quality. Whilst the approaching LU150 anniversary has constrained the timetable for completion, the quality of craftsmanship going into rebuilding the carriage has remained at the highest standard and is a credit to Festiniog Railway staff. The interior compartments are currently being fitted out with red plush seating and leather door panels, which together with the completed ceiling panels give a good impression of how the carriage will eventually look. Where practically possible the few original interior fixtures surviving from when the carriage was first built have been grouped together and fitted inside one compartment. Externally, work on the roof apparatus is starting to take shape with the fitting of wooden blocks to support the replica gas light copper piping. Unfortunately after researching railway heritage organisations and museums up and down the country, no original ‘Pintsch’ gas lamps of the type used on Met353 have been found. However, through studying a combination of historical photographs and archival drawings, eight replica gas lamps has been fabricated by Festinog Railways contracted specialist lamp company. Following the original design they are made from tin plated steel and of traditional soldered construction. Whilst we want the restoration to be as accurate and faithful as possible, we don’t want passengers to have Victorian accidents. Hence the lighting will be powered by low voltage LEDs, whilst the ‘Wethered Patent’ style door locks will be modified so they cannot be accidently opened from inside the carriage when carrying passengers on the London Underground. After a considerable amount of time inverted (to aid the fitting of braking components) within the workshop, the underframe is now the right way up and almost complete. As I write the only parts remaining to be fitted are the step boards and ‘Swan neck’ section of vacuum piping. Once the carriage body is complete it will be mounted onto the underframe and the heating pipes and emergency stop system connected together. If all goes to plan static testing will be undertaken at Boston Lodge in the first week of November, followed by dynamic testing on a standard gauge heritage railway line soon after. This will be the first time the carriage has operated on a railway line in over 70 years and a sight eagerly anticipated. Needless to say the completion of the carriage forms just one element of a much larger event currently being developed, to bring the return of a passenger steam train under the streets of London as part of LU150 in January 2013.